My Thots: Let your voice be heard: Sign the Petition!!! It is important to note that since the commencement of anti-smoking campaign in the USA in 1964, more than 8 million lives have been saved which is an indication of the effectiveness of anti-smoking campaigns. In addition to this, the countries that have domesticated the WHO’s Framework Convention on Tobacco Control (FCTC) have been experiencing significant reduction in the prevalence of smoking in their countries. A major example is Ireland where there was 33% reduction in smoking prevalence in one year as a result of immense public support and high level of compliance for the tobacco control law. At the moment, an executive-sponsored bill on Tobacco Control has been forwarded to the National Assembly and there are also two different bills before the National Assembly sponsored by Senator Ifeanyi Okowa and Hon. Yacoob Bush-Alebiosu. We can say that without a doubt Nigeria stands to benefit immensely from the enactment of a FCTC-compliant National Tobacco Control law and it behooves us as patriotic citizens of Nigeria to call on members of the National Assembly to ensure relevant processes are put in place for speedy passage of a FCTC-compliant Tobacco Control bill. You can also support the Tobaccoctrl campaign by visiting our Facebook page, like our post, drop your comments and share the posts widely with your friends. 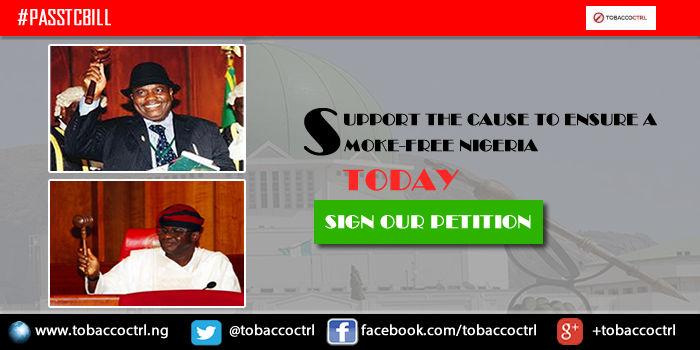 Let’s help make Nigeria a SMOKE-FREE country TODAY!